Heat oven to 450°F. Spray 15x10x1-inch pan with cooking spray. In large bowl, mix 1 tablespoon oil, the curry powder, salt and pepper. Add cauliflower; toss to coat. Spread cauliflower in single layer in pan. Roast uncovered 15 to 20 minutes, stirring once, until cauliflower is golden brown and just tender when pierced with fork. 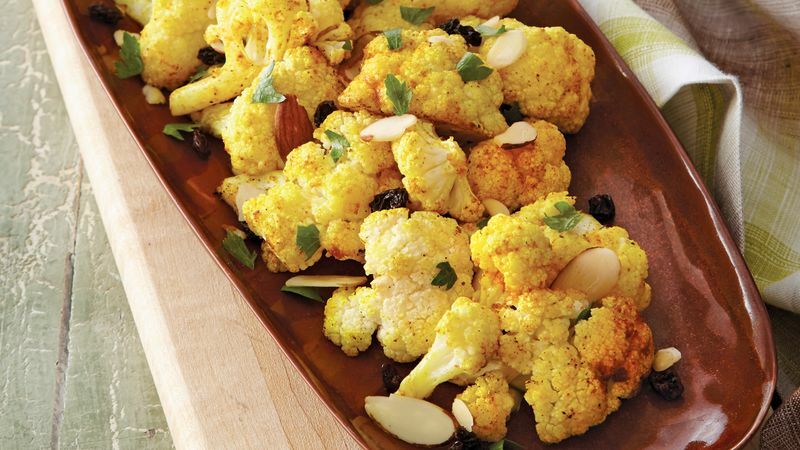 In serving bowl, stir together cauliflower, currants and almonds. In small bowl, mix 1 1/2 teaspoons oil, the lemon peel and lemon juice. Drizzle over cauliflower mixture; toss gently. Sprinkle with parsley. *To toast almonds, sprinkle in ungreased skillet. Cook over medium heat 5 to 7 minutes, stirring frequently until nuts begin to brown, then stirring constantly until nuts are light brown.